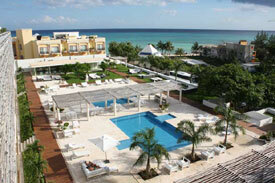 Vacation in beautiful Playa Del Carmen, Riviera Maya, Yucatan Peninsula, Mexico. We at SeaMonkey Business can act as your travel agent and we can book any hotel, condo, tour or activities. We are here to share our firsthand knowledge about sightseeing, accommodations, hotels, condos, scuba diving, ATV jungle tours, skydiving, and other activities along the coast of Mexico between Cancun and Tulum . This area between Cancun and Tulum is called The Riviera Maya (also known as The Mayan Riviera): it includes Isla Mujeres, Puerto Morelos, Playa Del Carmen, Puerto Aventuras, Akumal and Tulum. 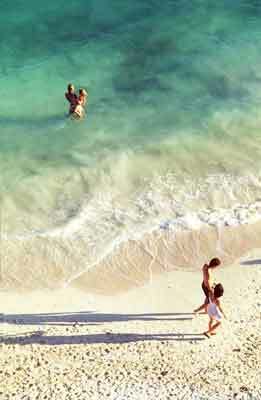 Playa Del Carmen is centrally located in the Riviera Maya, making it a perfect starting point for your vacation plans. This area is paradise for those who are seeking the infinite beauty of the crystal blue Caribbean Sea without the fast pace of Cancun. A quiet romantic getaway, tours of Ancient Mayan Ruins, a ferry ride to Cozumel for the day or a nightly stroll down 5th Avenue where you will find handicraft stores, sidewalk cafes, international cuisine and local live music...whatever your pace, you can find it here. You can even learn Spanish here in paradise. The once small fishing town and quiet beaches have certainly maintained a special allure and charm. 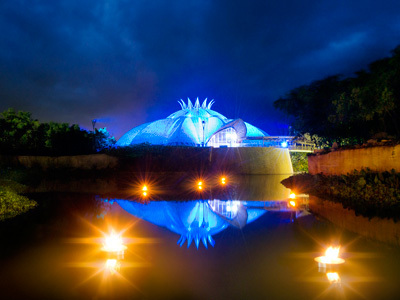 I have lived here for 6 years, working and playing in Playa Del Carmen, and have explored the surrounding areas. 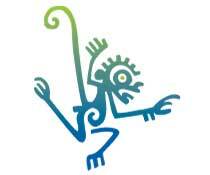 We can help you plan your trip, finding hotels and condos, and planning eco tours. We can also recommend the best restaurants and the local cuisine that is "off the beaten path". If you are planning a wedding check out our wedding planning page. We have the best dive shop and dive center in Playa and can take care of all your scuba diving needs. Our instructors are PADI and SSI certified and we offer open water dives, cenote dives, and certification courses all for an unforgettable experience. We also assist with booking all of the following activities : Transportation to and from Cancun airport , rental cars, snorkeling, golf, catamaran sailing, fishing trips, eco tours, ATV Jungle Tours, skydiving and helicopter flights. More often than not, people who come to Playa del Carmen fall in love with this area and are interested in buying property here. If you would like a piece of this paradise we have information on real estate for sale and questions and answers on purchasing real estate in Mexico. Maps of the area are also available. 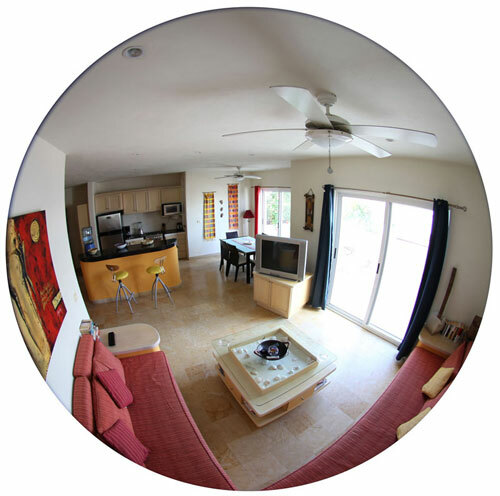 If hotels are not for you, you need to check out some of the amazing rental units that we have in Playa Del Carmen. These condos start at 450 per week to 3000. 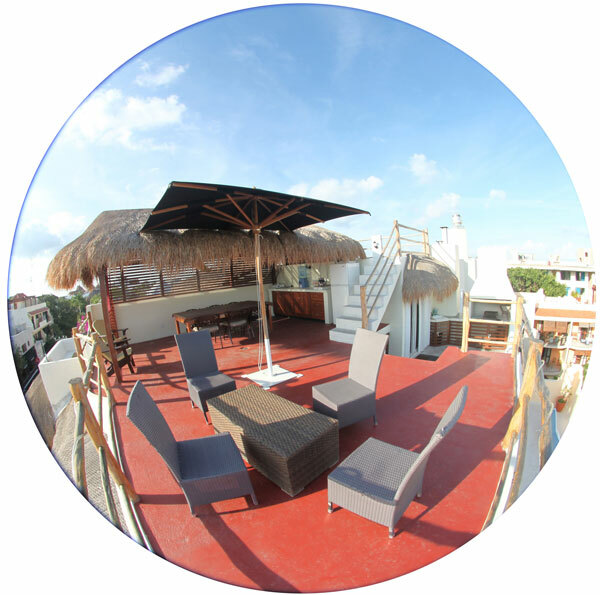 Check out Casita 16 Playa Del Carmen, the one on the photo. Just a few meters from the beach, has a private Jacuzzi, ocean view, pools and a gym. Price starts at $662 per week or $69 daily if less than a week. If you want to see other apartments for rent go to our condo rental page. Isla Mujeres Section with hotels, transportation, maps & more info. Isla Mujeres is located just 8 miles from the mainland near Cancun. It only takes 15 minutes by ferry and only costs about $3 USD. Isla Mujeres is only 5 miles long and 1/2 mile wide as you can see by the aerial photos of Isla Mujeres. 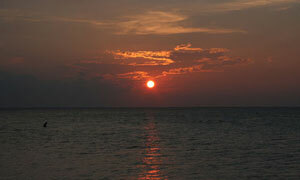 Holbox Island Visit this section that has information on hotels, fishing, tours and whale shark snorkeling. We love our community and are involved in two charities in the area, one being an animal charity. If you are interested in helping or know someone who is, please let us know.